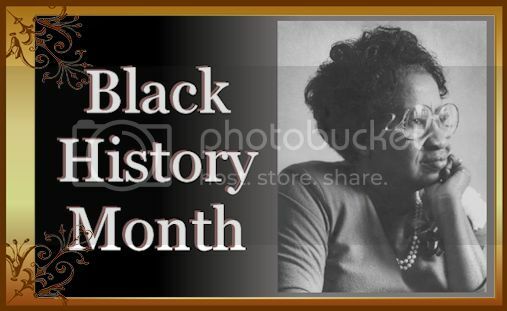 February has come to be accepted as "Black History Month" or "African American History Month" in the United States. About that, see this Library of Congress page and this January 2002 City of Oklahoma City Council resolution. It is all the more fitting, then, to review a book by ON African American history written by Rochelle Stephney-Roberson, IMPACT — Blacks in Oklahoma History (Forty-Sixth Star Press 2011). 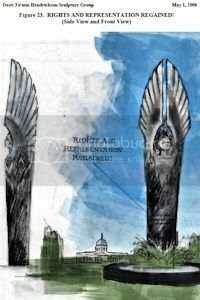 Both the publisher, Forty-Sixth Star Press, and the author, Rochelle Stephney-Roberson, are local to Oklahoma City, and, as an owner and reader of that book, it gives me pleasure to review this fine contribution to Oklahoma, and Oklahoma City, history which was published in late 2011. About The Author. Ms. Rochelle Stephney-Roberson describes herself as having been born and raised in Oklahoma City and says that she grew up in a large family in northeast Oklahoma City. 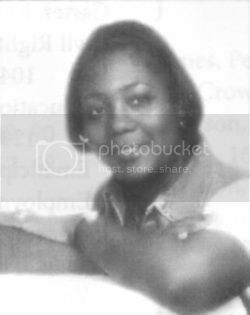 After being graduated from Douglass High School, she received a bachelor of science degree in Education and a master's degree in Library Science from the University of Central Oklahoma in Edmond. She says that she "began working in the Oklahoma City Public Schools system in 1981 and again in 1986," and that she "has worked with and educated youth for over 25 years." 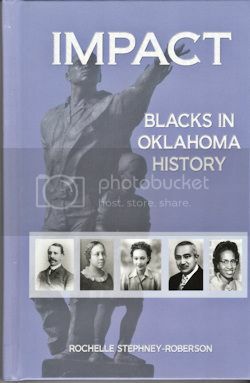 The reader should know that this resource book is nowhere near a complete history of black history in the State of Oklahoma. It is only the tip of the iceberg. There are many important African Americans who have made a huge impact on this state who are not included. This is not because of their lack of importance or the amount or type of their contribution, but due to the fact that I simply had to have a cutoff point for my research. 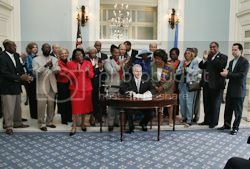 ¶ Throughout my many years of working in the public school system, I found that a large number of youth are not educated about the wonderful impact many African Americans have had on the state of Oklahoma as well as the nation. This is not because students are not interested, but because there has simply not been a tool of this kind available. The book's publisher noted to me that the book was written to state public school standards for history and that it has been accepted as a textbook by the state committee and, in fact, a second soft-cover book, a student's activities workbook, was simultaneously published. The book's website says that, "The Activities Edition contains multiple choice, T/F, fill-in-the blank, and word finder puzzles useful to school teachers and homeschoolers." The "activities" book is not covered by this review. Book Content Overview. 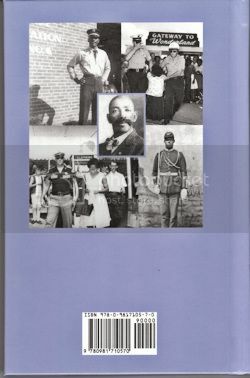 As a survey book, the main book presents a significant review of a substantial amount the history of Afro-Americans in Oklahoma. It proceeds chronologically time-wise beginning with Indian Removal to Indian Territory through the end of 2011. Although the Land Run and earlier period is covered rather superficially, much greater detail is presented after the Land Run period. Book Content Detail. Below, I've expanded the book's Table of Contents to include many of each item's components so that the breadth of topics covered is plainly evident. Click on the image below for a more readable view. Note that items I've marked with with an asterisk relate to Oklahoma City — for others, I've added a parenthetical city or county which is the primary focus of those items. I've numbered items to better show the breadth of the number of subjects actually covered by my numbering system, that's 160 topics within the space of a 198-page book and that's pretty impressive. Introductory Items. Only three pages cover the time leading up to and inclusive of the April 22, 1889, Land Run into the "Unassigned Lands," inclusive of where Oklahoma City is today. This period begins with removal of the of the Five Civilized Tribes — Cherokee, Creek, Choctaw, Seminole and Chickasaw — into Indian Territory during the 1830s. Each of these tribes were located in southeast portions of the United States where members of those tribes owned properties, plantations, and slaves — just as their white counterparts did. When those tribes were coerced to leave their homelands and remove into Indian Territory, their black slaves came with them. The Civil War resulted in those slaves being "freed" — hence the name "Freedmen" came to describe the former black slaves of the five tribes. As to the April 22, 1889, Land Run, the author's description of "Boomers" and "Sooners" is an oversimplification. Boomers were not only those who advocated opening the Unassigned Lands for white settlement and participated in that Land Run, some Boomers also laid claim to property by virtue of their prior claims based upon presence upon it before the Land Run. And, not all "Sooners" were people who illegally entered the area before the Land Run began — there were plenty of "legal" Sooners, as well (e.g., law enforcement officials, railroad employees, and others who were legally present before the Land Run) who tried to make their claims to Land Run properties. Detailed Black History Items. In this section which comprises the vast majority of the book, the author is much more fact specific and this is where she shines. Here, beginning with All-Black Towns and individual people, particular topics, and events, the author does a much better job than she did in the initial section. Although the author uses no footnotes or endnotes to credit her various statements, she does give an itemized description of "Selected Sources" at the end of the book which include five books, twelve newspapers, thirty-two personal interviews, and many other internet and sources. Were the author to have included footnotes or endnotes, however, the book's resource status would have been much enhanced. Aside from that criticism, the text reads easily and smoothly and presents much more information on the history of blacks in Oklahoma than I've personally seen anywhere else. There is something to learn in this book for everyone. 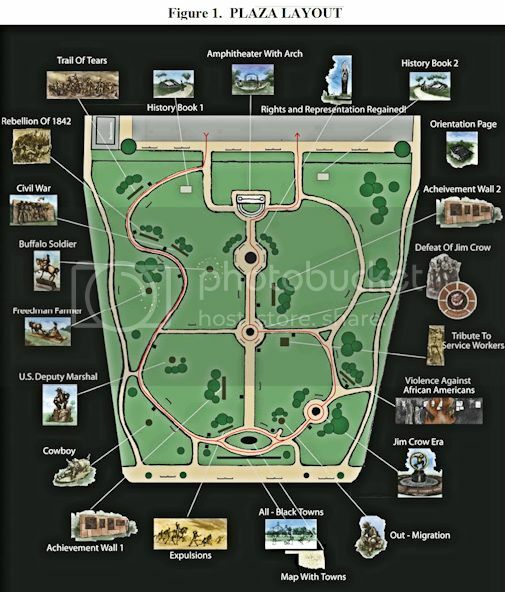 For example, in the author's description of Oklahoma State Senator Constance N. Johnson from Oklahoma City, she gives a description of the "African American Centennial Plaza" which is intended to be around the State Capitol Building in the areas shown below. The source of the map is a PDF file at www.ok.gov/DCS/documents, a source not mentioned in the author's book. 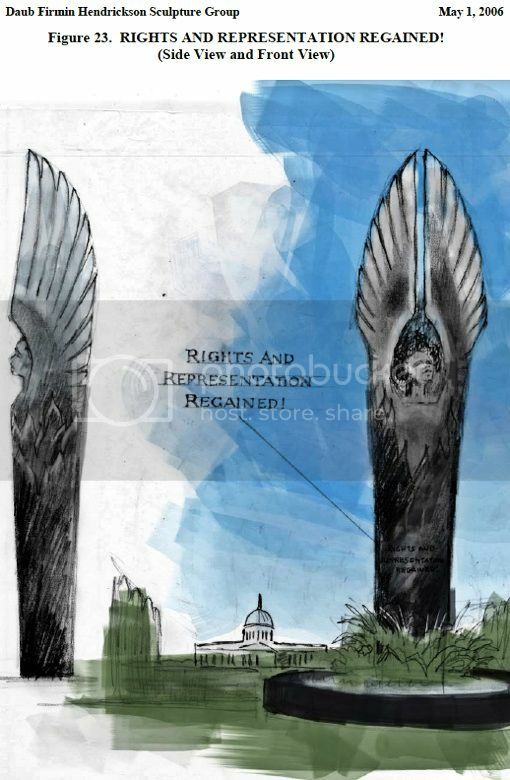 The bill approving this project was signed into law by Gov. 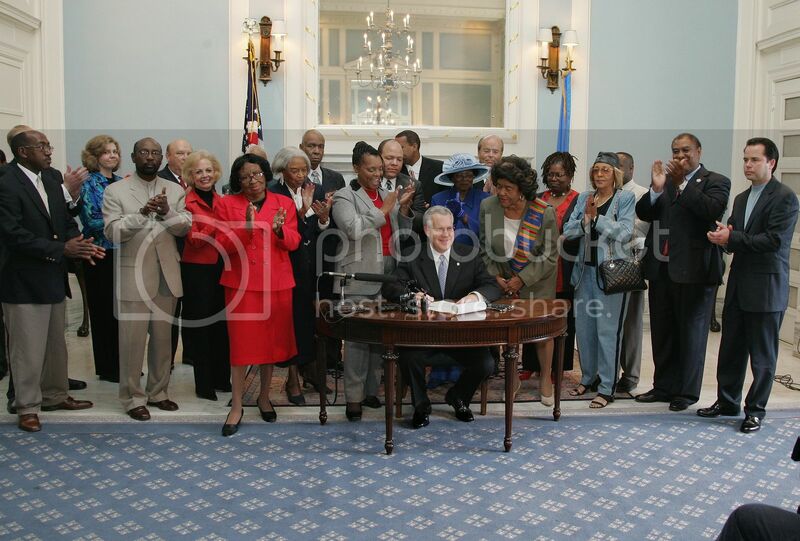 Brad Henry on October 27, 2006, but the project's funding has thus far not been approved by Oklahoma's Republican-controlled Legislature. Hopefully, that will change and this project will get done. Oops! There is one biography that the author might have been prudent to avoid, Oklahoma County District Court Judge Tammy Bass-LeSure. 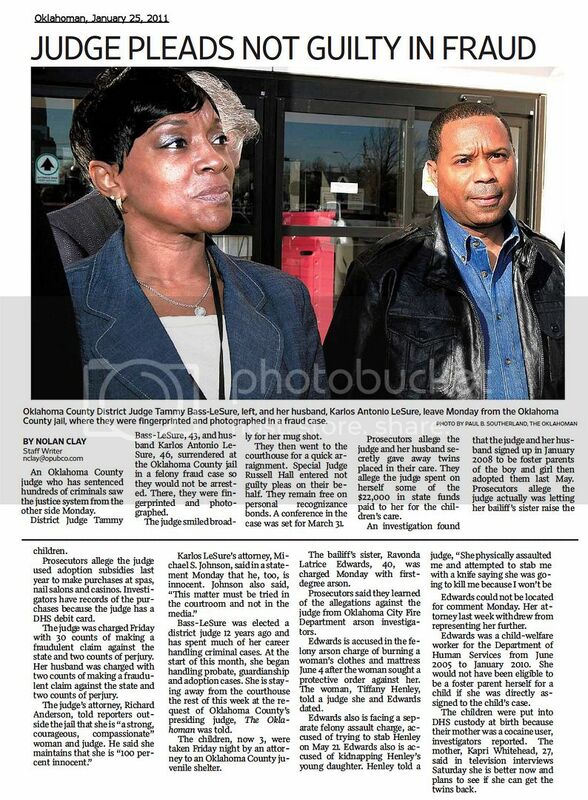 In January 2011, Ms. Bass-LeSure was charged in District Court, Oklahoma County, with fraud in connection with adoption and related matters which were personal to her and her husband, and at least that much information was known to the author before this book came to publication in late 2011. 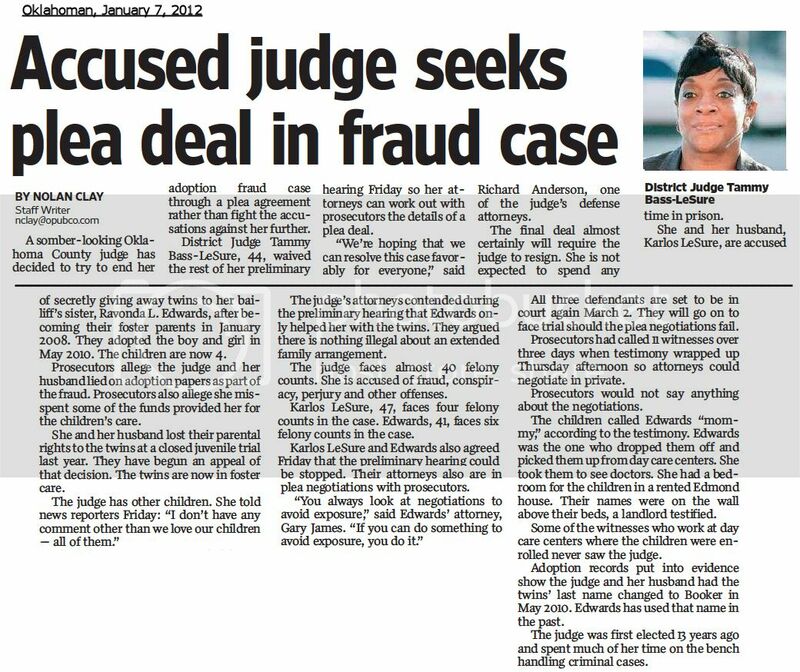 A year after charges were filed, in January 2012, it was reported that Judge Bass-LeSure was negotiating a plea agreement on those charges with the District Attorney. Perhaps the author was intending to give a vote of confidence to the judge well after charges were filed, I don't know. But, if that was the intention by including the judge's biography, it appears to have been misplaced. Additional Features. To the author's credit, the book contains a 3-4 page Index, even if it is not as detailed as I would have liked. 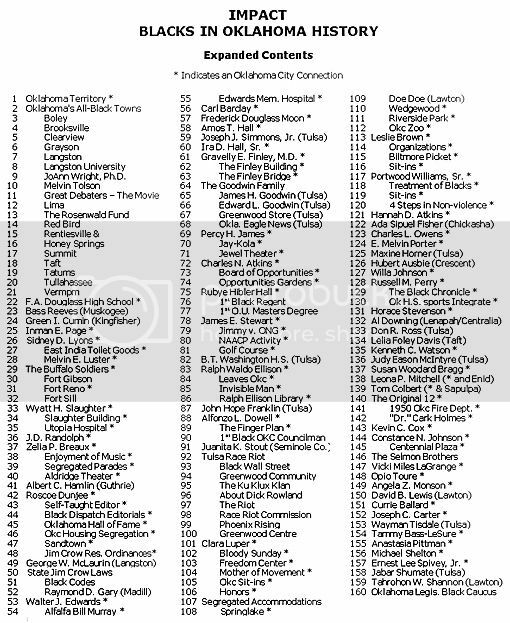 For example, at page 79 a section describing Percy H. James notes that one of his projects was the Jewel Theater (which, although the author doesn't say so, was located at 904 NE 4th Street in Oklahoma City), saying that it was the first movie theater for blacks and opened in 1931; however, the Index does not mention the Jewel Theater. (Incidentally, the Aldridge Theater built in 1919 predated the Jewel, as the author notes at page 46). 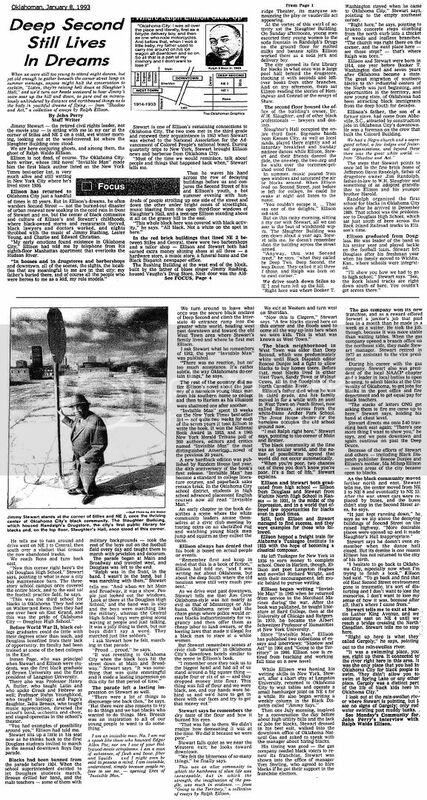 Following the index, three pages of "Selected Sources" identifies five books, twelve newspapers by name (but not particularly identified by issue and/or article), five periodicals (ditto the previous comment), and the names of thirty-two people who were interviewed by the author, and twenty-six websites that the author used as resources. My Rating. Using the same bases that I have used for other Oklahoma History Books, these are my conclusions. For almost three decades beginning in 1936, many African-American travelers relied on a booklet to help them decide where they could comfortably eat, sleep, buy gas, find a tailor or beauty parlor, shop on a honeymoon to Niagara Falls, or go out at night. * * * ¶ Historians of travel have recognized that the great American road trip — seen as an ultimate sign of freedom — was not that free for many Americans, including those who had to worry about “sunset laws” in towns where black visitors had to be out by day’s end. A last criticism is occasional oversimplification, e.g., at page 60 it would have been worthy to note that Gov. Alfalfa Bill Murray imposed martial law on Oklahoma City in 1933 concerning where blacks and everyone else could live, and at page 48 the author included a newspaper clipping but did not identify the newspaper. Images: 4 Stars. All are black and white and I understand that cost is a factor and I don't fault the author for that. But there are not enough of them to suit me, at least. For example, inclusion of the overall map of the African American Centennial Plaza, shown in this review, would have better shown the breadth of this project than the one image which the author did include, shown at right. An abundance of images are available which would have made this book more attractive to those who like to "see" elements of history that an author is discussing, and I'd suppose that to be particularly true for secondary school students, one of the author's main audiences. It's true for an old geezer like me, as well. Quality of Production: 5 Stars. Paper quality is good and the black and white images are crisp. Of course, color would have been good but would have bumped the cost of the book considerably. Given that this book is primarily intended for education and not coffee table usage, I have no criticism of the production. Worth the Money: 5 Stars. Absolutely. Although I bought my copy for $25 at Charlie's Books & Records, 5114 Classen Circle, Oklahoma City, other local locations are marketing the book. It can also be purchased at the seller's website or at Amazon for a slightly smaller price (plus shipping and handling). If you want to purchase locally, call before you go. For example, the copy I bought at Charlie's was the last copy he had, at the time. Overall Rating: 4 ½ Stars. All criticisms aside, I know of no Oklahoma survey of black history which approaches its level of completeness, and I do heartily recommend it.